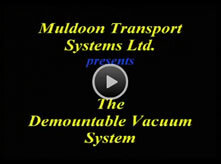 The "Muldoon" Demountable Vacuum system provides optimum efficiency, flexibility and ease of operation. This innovative product is the only system of its type available on the market today. 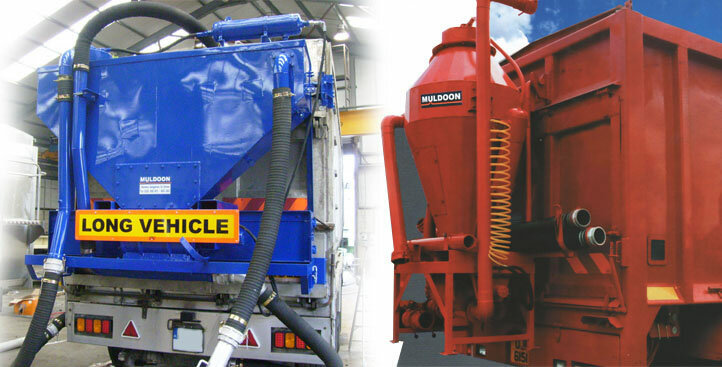 The Muldoon Demountable Vacuum System has been described as “an ingenious new concept in the collection of bulk materials”. A self contained highly efficient unit, this system enables the transfer of bulk materials from storage or warehouse into any compartment of the vehicle in use. The unit works by utilising the suction from your existing blower, but can be detached from the vehicle when not in use. 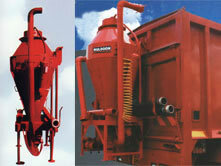 The system can subsequently be attached to any vehicle which has been fitted with the necessary piping. This unit provides companies with the ability to maximise cost effectiveness in the delivery and collection of various materials, including those at a distance from the vehicle e.g. the animal feeds industry. This system has been specifically designed as a modular sucker and blower unit. The positive displacement blower is used to create suction and blow materials through flexible tubing to discharge where required. 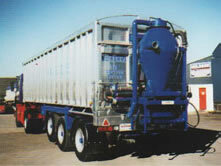 thus the vehicle becomes dual purpose and is capable of collecting material as well as delivering. 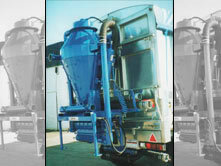 The unit has a cyclone separator which collects the grain (or any granular material) into a hopper at its base, where a GMS rotary seal allows the material to pass to the blowing chamber while maintaining the vacuum in the cyclone. The design incorporates a blast clean air filter on the suction side of the blower to eliminate damage caused by dust and grit. The whole unit is compact and has been designed to be mounted and demounted using a latch arrangement fitted on to the rear of a tipping vehicle. The lightweight construction allows for ease of attachment and detachment to vehicles. When empty, this lightweight feature ensures that no excess weight is added to the overall weight of the lorry. The transportability of the unit on an existing vehicle provides maximum cost-effectiveness, it does not tie up a vehicle fulll time on collecting duties, thus allowing a more productive use of vehicles, man power and time.